We sell Aloe Pura (Optima) products like Lifeplan Organic Aloe Vera Gel - 200ml online in the UK and directly from our award-winning store in Scotland. Aloe Vera Gel moisturises, softens and helps hydrate dry and sensitive skin. Great for after sunbathing, for dry skin or itchy skin. Lifeplan Organic Aloe Vera Gel is produced from 99% pure Aloe Vera Barbadensis inner gel. Aloe Vera may help to soften, soothe and moisturise the skin. We sell real Aloe Pura (Optima) and other Dry Skin directly from our shop in Scotland and online throughout the UK. View more products from Aloe Pura (Optima). Where can you buy real Aloe Vera Gel - 200ml safely online? If you are wondering where you can buy Lifeplan Organic Aloe Vera Gel - 200ml safely online in the UK, then shop with us. We are an actual health foods shop; with real people selling real foods and products. Our award-winning independent shop is located in Stirling, Scotland since 1976. You can buy our Dry Skin in store or safely place an order with us online or over the phone. 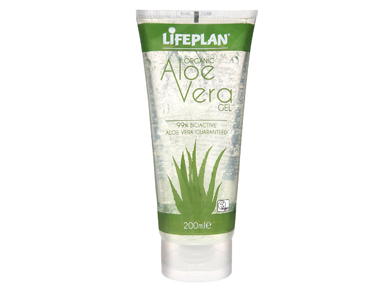 Aloe Vera Gel - 200ml - Lifeplan Organic Aloe Vera Gel - 200ml in Dry Skin and Medicinal Skin Care.